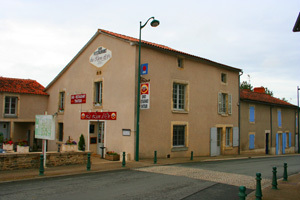 It was a rainy Tuesday evening and Trevor and I were going to the Lion D’or a restaurant in St Hilaire de Voust near La Chataigneraie which had been recommended to Trevor by several people. We had booked our table for 7.30 and joked with each other about the fact that we would probably be the only ones there, as is often the case when partaking in evening mid week dining in the Vendée. We entered the restaurant through the bar and the small dining room, with seating for about 30 cosy covers, was pleasant enough with a Vendéen beamed ceiling and a country style decor. The bar was quite busy with what turned out to be diners having a drink and selecting their food, the dining room was however empty when we entered. Trevor went to use the facilities, which were outside of the building, so I ordered a ½ litre pitcher of the house red wine which turned out to be a smooth and fruity drink and was reasonable value at 5.60 euros along with a non alcoholic beer for Trevor. The restaurant is run by husband and wife team Laurence and Patricia, and it was Patricia who brought the menus, and took our orders, she spoke very good English and the other young waitress who was working with her spoke such good English to the other diners who had filtered in to the dining room that I felt duty bound to compliment her, when she replied it was with a slightly northern accent and she told me she was in fact an ex-pat. Just like the entrees the choice of main course was extensive with nine options on the menu and several specials on the board. I could have chosen any one of them. I was very tempted to go for the rib of Partenay Beef which is a superior breed of local cattle, but it was being served as a stew rather than a cut. I decided on the Fillet de boeuf en croute Wellington, legumes de saison et sauce Porto, which is Beef Wellington with seasonal vegetables in a Port wine sauce, and came with a 3 euro supplement. 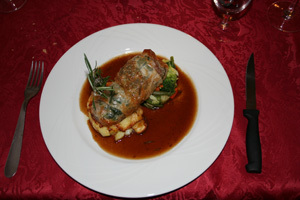 Trevor went for the Fillet d’ agneau en habit vert, sauce romarin et gratin dauphinois, translated that was fillet of lamb wrapped in spinach and filo pastry with a rosemary sauce and dauphinios potatoes. The beef Wellington was stunning, it was a huge piece of beef and it was hard to distinguish between the beef and the pate surrounding it in terms of tenderness, it truly did melt in the mouth. The beef was spectacular and was superbly cooked the pate was tasty but not overpowering and the pastry was right up my street. 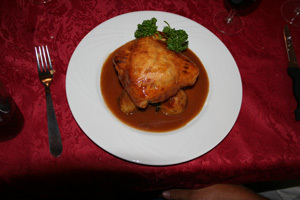 The taste combinations were perfect, the vegetables were fresh and very well cooked and there were roast potatoes. I forgave the fact that they were not crispy, just for the fact that they had actually tried. The only complaint that I could level was that the whole course was too big, I would personally have preferred the Wellington to have been half the size perhaps without the 3 euro supplement. I suspect however that the restaurant is the haunt of the English and as such the portion sizes are such that it attracts the gourmand as well as the gourmet. I tasted Trevor’s lamb which once again was cooked to a tee, pink and full of flavour it was wrapped in spinach and a delicate filo pastry which were an ideal accompaniment, and the rosemary sauce was as one would expect in perfect harmony with the lamb. His meal was a more manageable size than mine and he did comment that he didn’t feel that he would have been able to finish the Wellington. Next we had to select our deserts. There was once again a decent choice with amongst other things Creme Brulee, Isle Flotante and two pages of ice creams. Unfortunately I’m a sucker for chocolate fondant, so I went for that, despite the feeling that I would struggle to force anything else down after the beef. 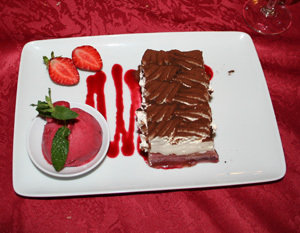 Trevor went for the tiramisu with a raspberry flavoured sorbet, I tasted Trevor’s before tucking into mine, it was good and the raspberry sorbet cut through the rich creaminess of the tiramisu balancing its sweetness. My fondant was, as it often is here in the Vendée, more like a piece of cake than the hot pudding with the oozing centre that I associate with fondants and love so much. It was served with a crème Anglais with a cherry sauce laced through it, it looked very pretty and for the cherry lover would I’m sure have been a delight, I personally am not a great fan of cherry sauces, I find them generally cloying and overbearing and this was my take on this desert. 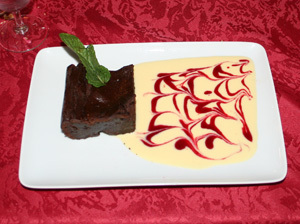 The chocolate fondant was served cold and was cake like and because of this I had to eat the crème Anglais and with it the cherry sauce, so I was personally disappointed with it. 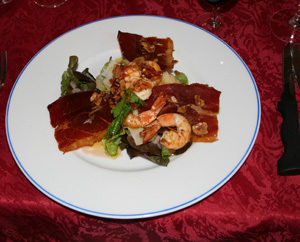 This is however a personal view and should in no way detract from the quality of the cuisine, which was of an exceptionally high standard. We finished our meal with two large white coffees sadly they didn’t come with a chocolate and so although they were large, hot and milky they failed the Trevor test and regretfully my cup had a slight chip in it. 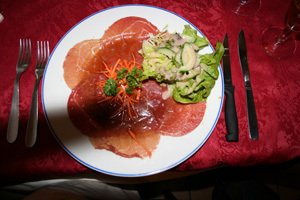 Laurence is without doubt a talented chef, and the meal as a whole was amongst the best that I have eaten in rural Vendée. Patricia, in spite of being six months pregnant, ran the front of house very efficiently and although she was very busy she was never without a word and a smile. 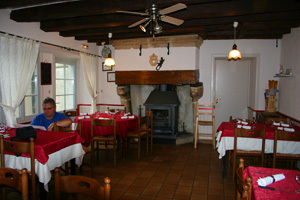 The dining room was cosy and it was full, which is no mean feat in rural Vendée for a rainy Tuesday evening in June. It was for me a shame that all of the diners were English, I do prefer to dine with at least a smattering of locals as it tends to lend my experience a certain degree of authenticity. In addition to the large and varied menu there is an extensive Pizza menu, the pizzas were big and looked very good. I confess that I am a pizza lover and they looked so good that I can see myself going back just to try them, or maybe even ordering one as a take away.